A CRM built for small businesses, offering tools for both contact record management and marketing and sales automation. 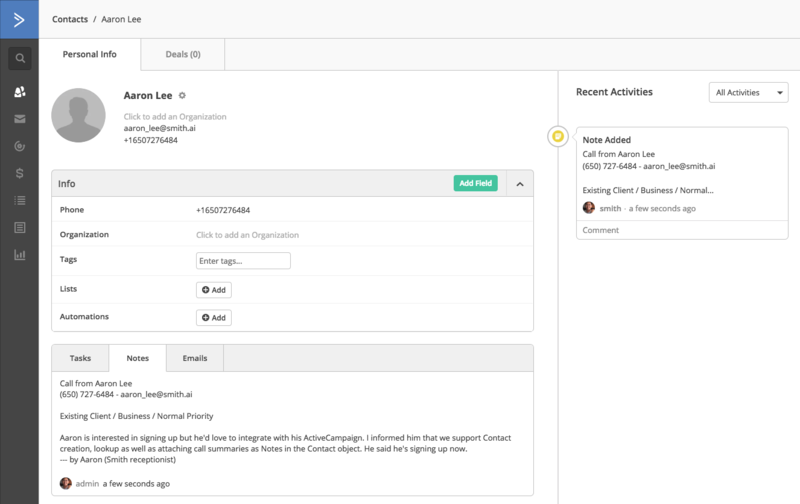 Smith.ai now integrates with ActiveCampaign so callers' contact information and post-call summaries are logged in your records instantly after each call. New contacts are added and existing contacts are updated, with full transparency that these activities came from Smith.ai. It's just another way Smith.ai is making your small business more efficient by automating processes that otherwise would result in time-consuming copy-and-paste tasks.